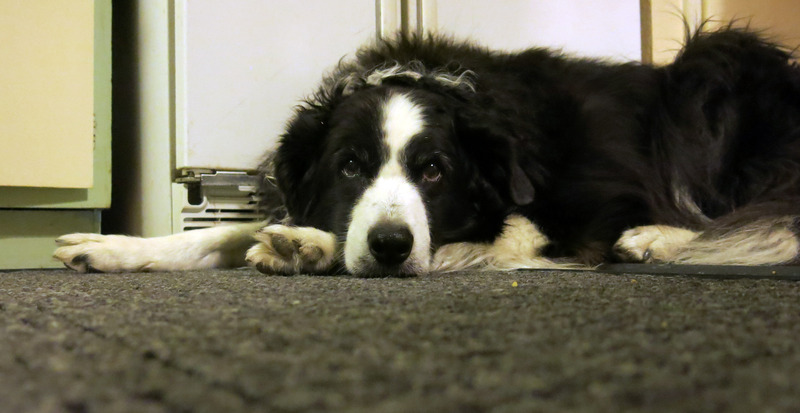 Greetings and salutations everyone; yes, once again it is I, Chess the purebred border collie, filling in for the guy I live with, and here today to, well, talk a little about the nut I live with. You may remember me from such similarly-themed posts as “Life With A Nut”, and “Life With A Nut, Part Two”, among so many, many others. Here I am in a characteristically appropriate pose. I’m feeling quite good, I must say, and the guy I live with has been taking care of me pretty well (even to the point of putting some butter on my freshly-steamed piece of pie pumpkin so I would eat it), but, you know, he is kind of a nut. Take today, for instance. He suddenly got the idea that since the sclerocactus seed sitting outside in pots hadn’t germinated in a couple of years, which is typical, he decided to go through the pots and pick out the seed, to save it for later. (The seed will be chipped and germinated under pseudo-laboratory conditions. There’s a YouTube thing showing how to do that, you just look up “germinating sclerocactus seed”, and there it is.) Some of the seeds did germinate this past spring, but he said this was taking too long. Like there are other things to do. So this was what he looked at. Go ahead, find the seed. The seed is black, shiny, and hard as a rock. It can sometimes take years for the seed coat to abrade sufficiently that water can get in, and start the germination process. Which is why chipping is quicker. Here’s the seed, right at the end of the tweezers he went out and bought. The little black thing. Another one. This is seed of the endangered Sclerocactus mesae-verdae. 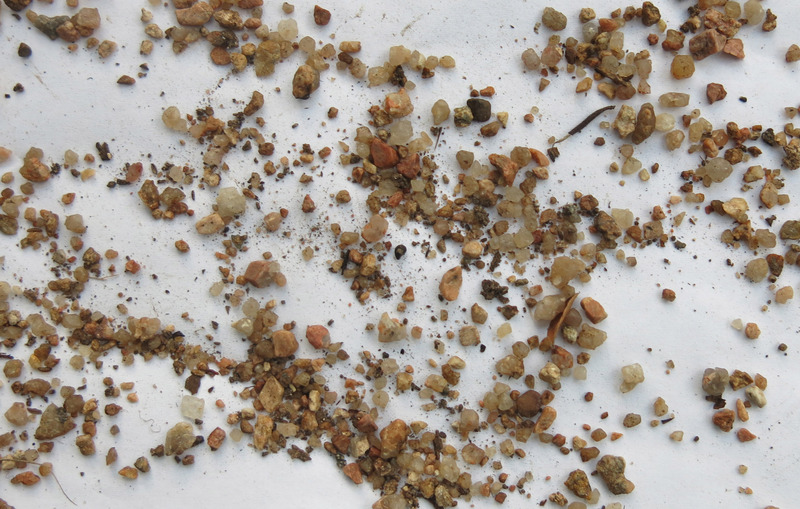 In this picture, seed of Sclerocactus havasupiensis, right smack in the center of the picture. The guy I live with collected more seed than you might think was possible using this method, with several different magnifying lenses, and then afterwards said he was really dizzy, and had to go inside. The guy I live with is mighty proud of this moss. I’ve heard, and maybe told, the story of how the guy I live with tried to encourage moss to grow on the troughs by spreading buttermilk on them, and then a few minutes later heard this “strange, rasping sound”, which was my Uncle Pooka licking off all the buttermilk….. and so he collected a few pieces of moss when he was up in the mountains and planted them in the troughs. This was what was in flower. Crocus niveus. The flowers are almost two and a half inches (6cm) across. “To be precise,” he said, “it’s Crocus niveus AH.0166….” Whatever. I know stuff like this makes him happy, and so I go along with it. My mommy did too, up to a point. Okay, that really is it for today. The guy I live with says he’s still dizzy, and I’m not sure I feel all that sorry for him, since anyone would know that this could happen. I’ll leave you with a picture of me taken while all the seed-searching was going on. 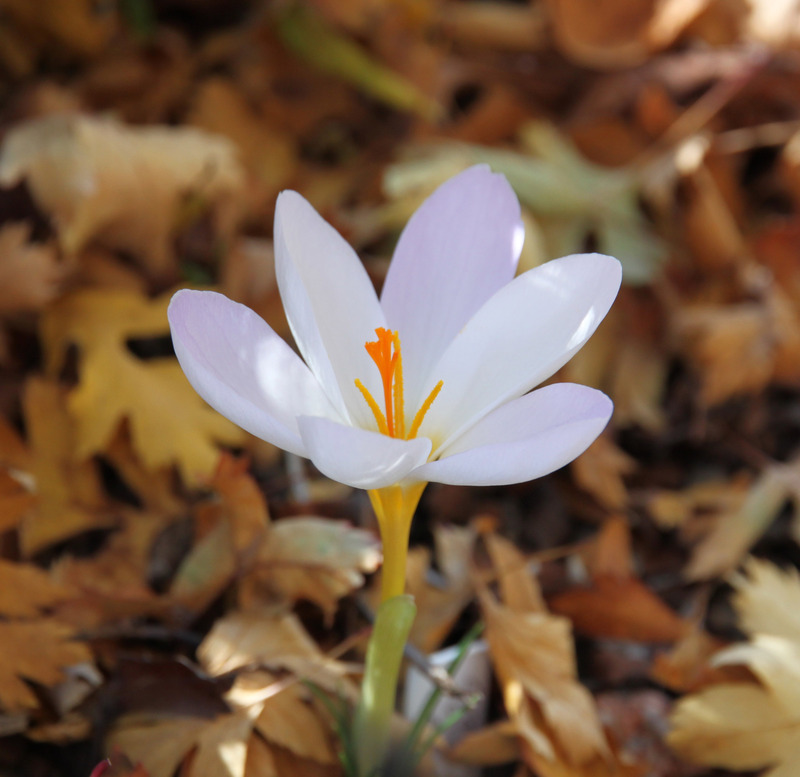 This entry was posted in Uncategorized and tagged Crocus niveus. Bookmark the permalink. Hello Chess, that is one big crocus, your guy should be proud and the moss really is lovely. We used to have moss and lichens at our old place but not here. Both photos of you are just gorgeous as usual. I like the reasons your guy is coming up with for his out of focus pictures, very inventive. The crocus glows. 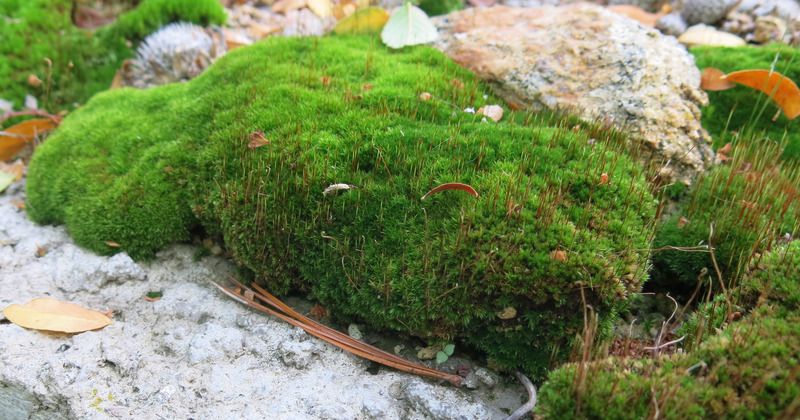 The moss excites me. 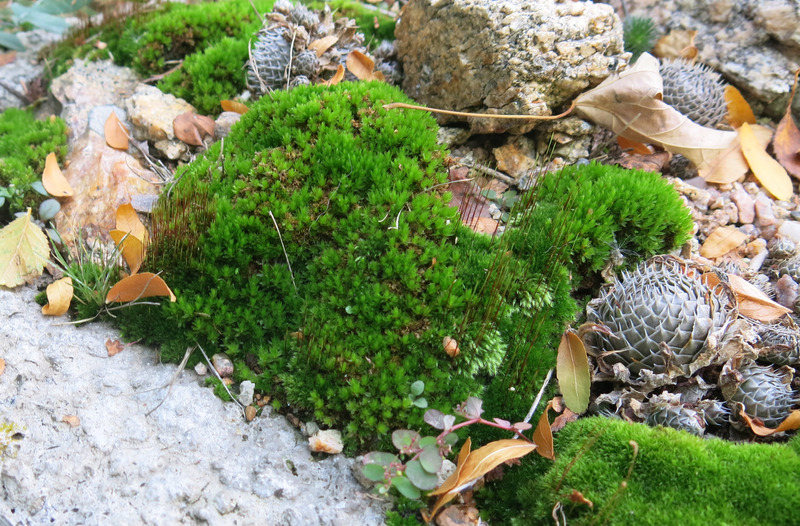 Every time you’ve mentioned the Moss Gardening book, I think, “Hm. I wonder if that’s the book I have.” Well, this time I wrote down the author’s name and trekked all the way down to the basement to look. And yes, yes indeed, it is the book I have. Plus I discovered a whole lot of other interesting-looking gardening books that I’d forgotten I owned. One of the things about a leaky memory is just this sort of ‘discovering.’ It can be like Christmas sometimes. Chickadees use moss to build their nests, and they are the softest-looking, sweetest nests I’ve seen. 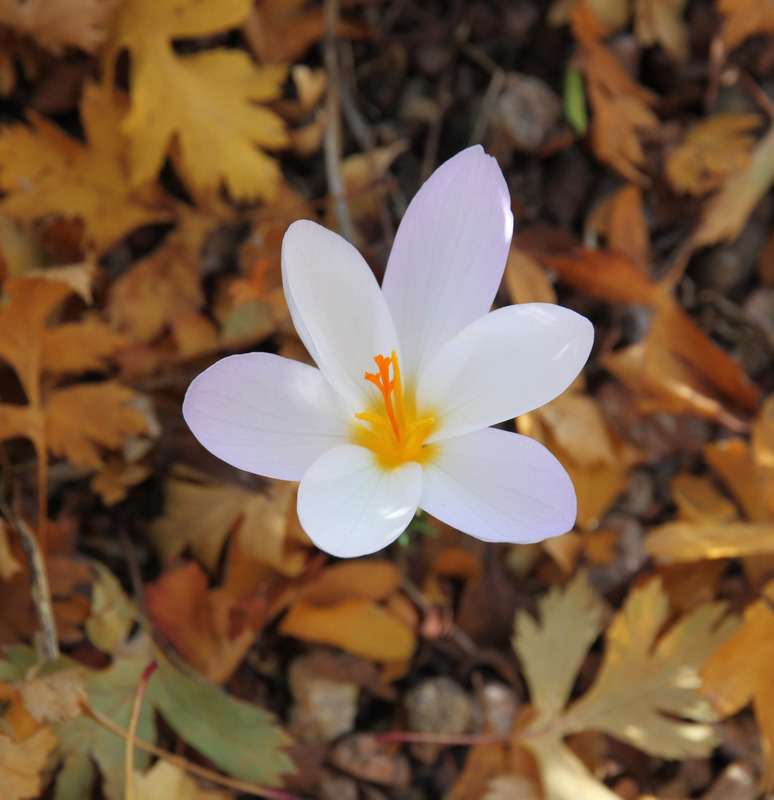 The crocus doesn’t know it’s not in the Peloponnese…. C. niveus seems to be hardy here, what with our zero rainfall in winter, hot sun, etc. (The phrase “hot winter sun” is used around here a lot. It might seem weird to other gardeners.) Birds do tear apart the moss sometimes, which makes someone all irritated and huffy. Aside from Moss Gardening, and the shade gardening book by Schenk, there’s also Gardening on Pavement, Tables, and Hard Surfaces. It makes me happy when critters find my gardening efforts useful . . . as long as they leave some for me to enjoy. Gardening for Use would be the title of my book. We don’t much care for the idea of plants being consumed, but the occasional hopping around or making nests in trees is perfectly acceptable. If it weren’t for critters consuming some part of a plant, many plants would not reproduce. I assume the ants that plant the cyclamen seed are carrying them off to eat? There would be no butterflies or moths without plant consumption by the caterpillars. There would be no humans without plant consumption. That Sclero germination method. Yep. That’s what you do, the needle thing, as told to me by my friend who grows Scleros. 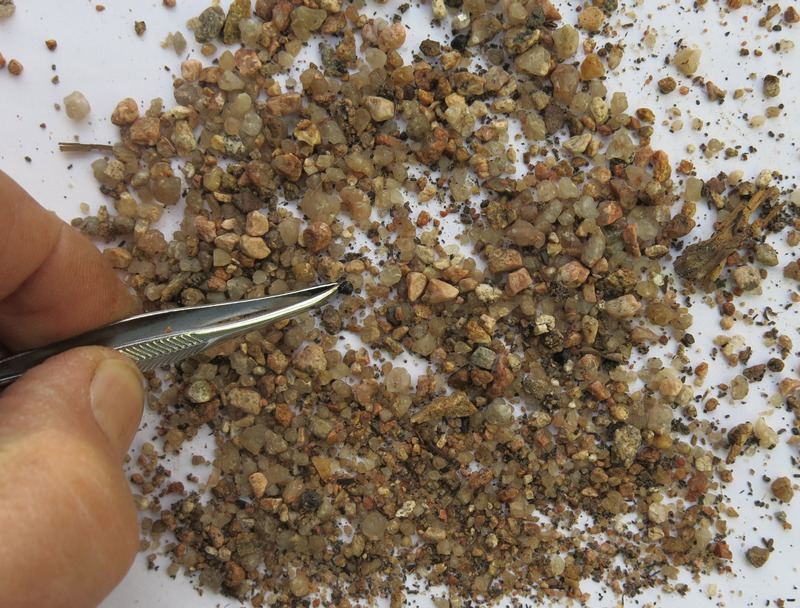 Explain why sterilizing the seed is so important. Fungus that attacks seedlings on the seed coat needs killing off? Steps like that always seem dubious to me. Apparently the seed coat is where all the icky bacteria is, or could be. You do the same thing with oncocyclus iris seed, using the forced germination method, but those go in the refrigerator for “an unspecified period of time” (here, ten months, so far, with one iris seedling to show for it). The thing is, the embryo is exposed, in both situations, and that is very vulnerable to fungus attack. Sclerocactus can be germinated outdoors. For every hundred seeds sown, you get one seedling every year. Hmm. Makes sense for germination in the fridge. It was implied that he does the needle thing and then just does outdoor winter germination to fabulous results. It’s an infuriating embarrassment of riches at his place. For cactus, probably just under lights. There doesn’t seem to be an absolute requirement for cold, just a need to have the seed coat cracked in some way. (Makes you wonder how the plants survive in the wild. Possibly the fruits are tasty to rodents, etc.) With oncos, even with the embryo exposed, they seem to need a period of cold. Years, sometimes. Ah, Chess, I know life is back in its happy place at your house when photos of crocus show up in this blog, and of course these are especially fine photos of especially fine crocus specimens. The guy you live with seems one to take pains with plant-growing; you must be afforded much fun. Perhaps pass on the thought that the Golden Means way is best, breaking up the search for infinitesimal seeds into increments. Sometimes dizziness does not disappear as easily and soon as one would like. I would know about this because I edited my husband’s article about an hour ago, and I am still dizzy. The green moss is so lovely, lush and soft. I should like to see it made into a gown. Your first portrait today combines a film star’s level stare with glamor pose, a combination any cover model should covet. The second portrait expresses forbearance marked with a show of boredom. To lift your spirits, contemplate your next plate of steamed veggie with butter, yum. Thanks; I did get some custom-steamed pie pumpkin with a tiny bit of butter, and, as you know, pumpkin is very good for dogs. The seed searching is finished. The guy I live with thought it might be a good thing to occupy his mind during the winter, but (you could see the light bulb glow above his head) he decided to use a horticultural sieve, or riddle, to get the seed. Some was gone, presumably eaten, but there was quite a lot. It can sit upstairs, each in its carefully marked packet, for years now, or until the guy I live with decides to work with a needle and loupe. meanwhile, enjoy the ennui of fading, brisk autumn days before the big cold snap and the onset of the dreaded snowflakes. i’ll check in on you again, fur shur. Thanks; I’m feeling pretty good right now. Go Find Momo is completely excellent, thanks. The guy I live with says that momos are excellent, too, like at a Nepali restaurant. They say it might snow, along with rain, some time next week. Hi Chess, You are looking adorable as always. I have been reading the blog for several months and am hooked. You also tell a good story and I love TGYLW’s photos. It does give me a better appreciation for crocus, cacti, “squishies” and other small, maybe unique, plants of the world. However, it can be desperately saddening when I lose plants, and I am so impatient I can’t think of a squirrel in any way as my friend. If I planted crocus, ect. this very day in the way TGYLW seems to the plants would be gone by next weekend. There is not enough chicken wire in the world….It’s like the old Rolling Stones Song—time is on the side of the squirrels. I think all of this is why I just like to read the blog. Sometimes I think TGYLW is winning. So, Chess, I will try to keep this comment on the light side. Can you get Bob (TGYLW) to post a few more cacti photos from the side of the house. Just one every so often. (Not that I don’t like crocus, Ipomopsis rubra and cyclamen also.) Are the plants changing in anyway now that the weather is cooler? How did you get the cactus planting spot there by the house? 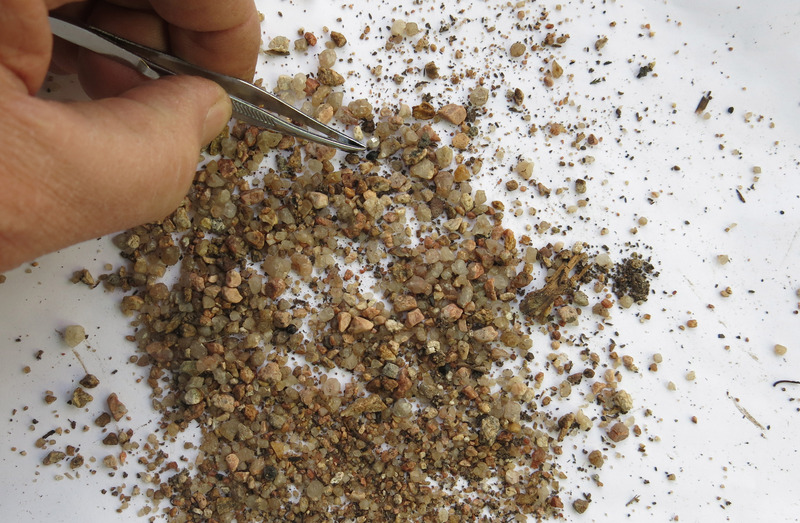 Is that stone natural to your neighborhood or was it shipped-in for growing cacti? I am not from Colorado, but am from the mid-west. We don’t have those kind of gardens where I live. The details such as this, and what Sclerocactus mesae-verdae seed look like, and what they like to grow in–they do intrigue some of us I think. Thanks again, Chess for all of your efforts to write about the garden. I truly have learned a lot. Thanks. I don’t have to work much at being adorable, don’t you think? We have lots of chicken wire cages for things like crocuses. I suppose some people might say that it adds a certain trashy look to the garden, but they don’t understand Seriousness of Purpose. The cactus garden, though, is right smack in front of the living room window, so if you’re standing on the front porch, it’s right there. The guy I live with dug out a lot of the existing dirt (there’s never really “soil” right by a house, is there? 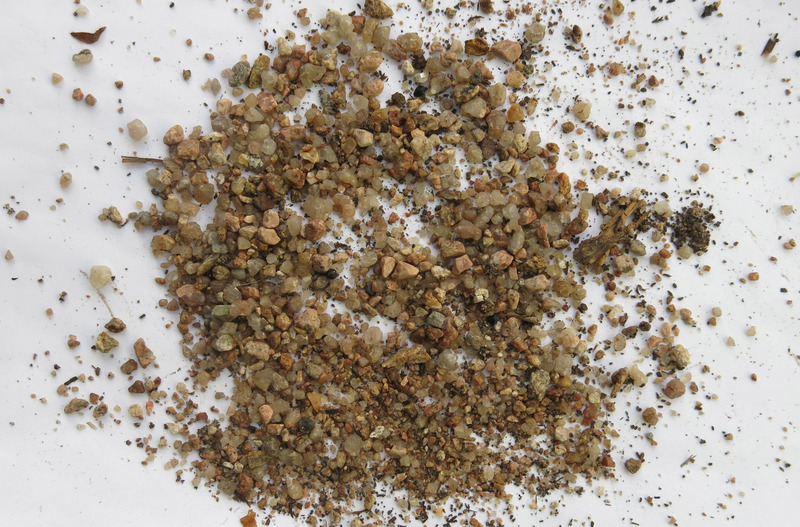 ), and ordered a bunch of pea gravel which he just piled there. The plants are growing in about two feet of nothing but pea gravel. There might be five people on the planet growing the sclerocactus right now and the guy I live with isn’t one of them. He aims to be, though. I understand there were some plants of it here a long time ago, but things happen. Mostly leaves are falling everywhere. We’re supposed to have a cold snap this week and what we usually see is the little rock garden plants kind of “tighten up” for the winter. They stay green, so there’s something to look at if there isn’t snow on the ground.